Bangkok, Thailand – Akaryn Hotel Group, the innovative hospitality company with a portfolio of boutique luxury hotels and resorts in Thailand, is sharing the love with a series of unique wedding proposal experiences for couples at four of its properties in Thailand. The Group’s creative operations team has come up with a selection of magical moments that are all about popping the ultimate question in a dynamic and decidedly different style, with options that include an underwater gesture of love, a floating proposal, a request unveiled from a fisherman’s net in the sea, and getting engaged during a fire-juggling show on the beach. “From our hip beachfront resorts to the urban sophistication of our city hotels, an intuitive and creative approach to hospitality is at the heart of every guest experience,” says Anchalika Kijkanakorn, Founder and CEO of Akaryn Hotel Group. “This sense of creativity runs through everything from our room designs to our culinary concepts, from our wellness offerings to our beach parties, which is why we’re giving the age-old tradition of asking for a loved one’s hand in marriage a contemporary fairy-tale twist,” she adds. Lovers ready to take the plunge can head to the stylish rooftop swimming pool at akyra Manor Chiang Mai to propose marriage. The bride or groom can be given a waterproof sign to hold up against the pool’s uber-cool glass wall when they dive below the surface so their life partner-to-be gets a delightful surprise while sitting at the bar. If the answer is “yes”, the couple can celebrate with and an afternoon tea set for two, or make a toast to their future with Champagne cocktails at RISE bar with its poolside sofas and funky in-pool sun beds. At another of the Group’s urban icons, akyra Thonglor Bangkok, lovebirds can make an original and indulgent proposal with a private dinner for two on the swimming pool deck overlooking amazing skyscraper views. 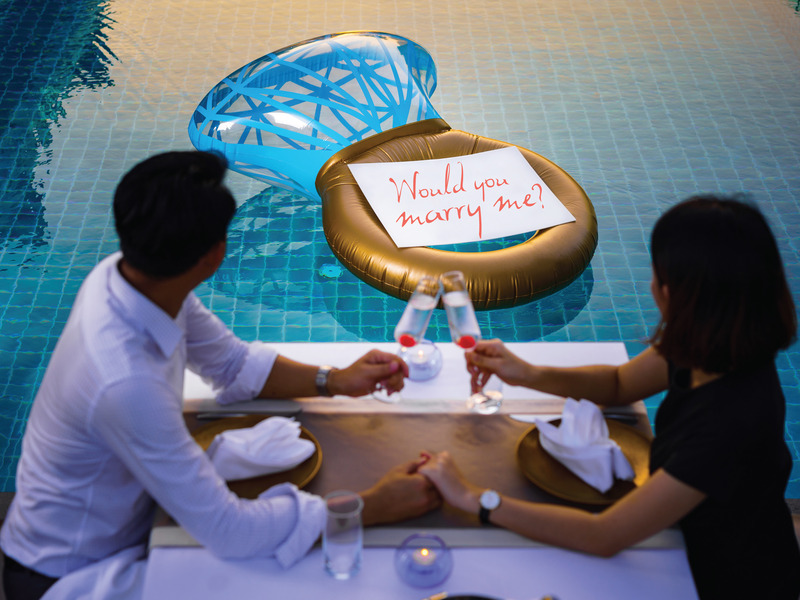 On special request, the chef will prepare an exclusive dinner and the moment can be further enhanced with a fun romantic proposal with a floating inflatable giant diamond gently drifts towards the couple carrying a sign that says: “Would you marry me?”. To take advantage of its stunning seaside location, romantic hopefuls staying in one of the private villas at Aleenta Hua Hin Resort & Spa can arrange for local fishermen to discreetly enter the shallow waters with their authentic shrimp net, and as they come closer to the guests, lift it up so that the words “Will You Marry Me?” pop up on a large piece of wood as an unforgettable catch of the day. Last but not least, to fan the flames of passion at Aleenta Phuket Resort & Spa, couples can arrange for a private fire juggling show to accompany a romantic dining experience for two on the soft sands of Natai Beach. The climax of the performance can be an astonishing proposal, unveiled with “marry me” letters of fire lit up by staff on the beach just a few metres away from the couple, adding drama and excitement to a moment forever remembered.